The FI-WP2V system allows for 10 frequency groups, each with up to 16 channels, adding up to a total of 160 usable channels that won’t interfere with each other. The onboard Digital Volume Control system removes the need for a volume control knob and allows for seamless use between different microphone users. Up to 16 transmitter/receiver systems can be used at the same time. for tweaking of mic’s sensitivity to suit the vocal performer. A back-lit LCD display shows the operational status of the microphone, including current group, channel, battery charge, and lock status. The removable grill allows for easy replacement if damaged. 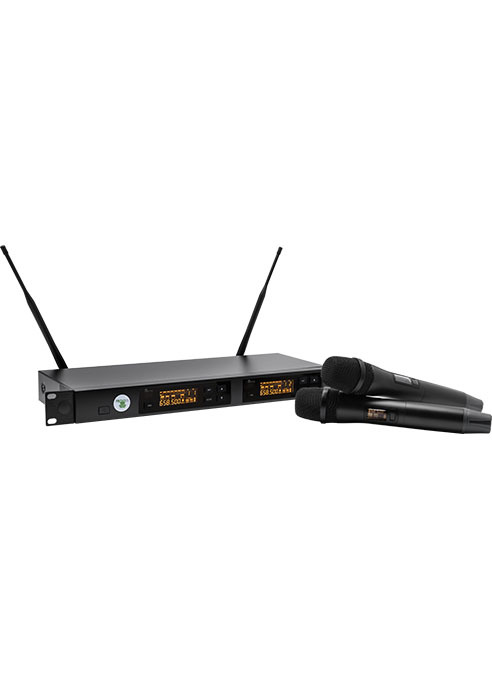 This microphone is perfect for performing bands, weddings and other functions with multiple or animated/ mobile speakers or vocalist. automatically pairs the transmitter and receiver to the same frequency, and this system is as simple to set up as 1-2-3! To make life even easier, an onboard digital volume control system automates the volume level outputted ensuring maximum signal strength without distortion / clipping. The result is a clear, even sound between different speakers / singers. of the radio waves, or when a performer moves around stage with the transmitter. This is known as True Diversity reception technology, as opposed to quasi-diversity reception, which uses two antennas but only monitors one at a time, switching when that antenna drops below a certain signal strength, regardless of the strength on the other antenna. 2 Rack ears come with the unit for installing into a rack system. A mute level control on the rear of the unit acts like a noise gate and is useful if there are interference noises when the mic is not being used. The back-lit LCD shows the status of each receiving channel, including the current group and frequency, and active antenna. The 6 segment LED meter indicates RF signal strength and audio input levels. This is the ideal mic for most lead vocalists. It’s also great for stage situations in which a mic will be passed from person to person.